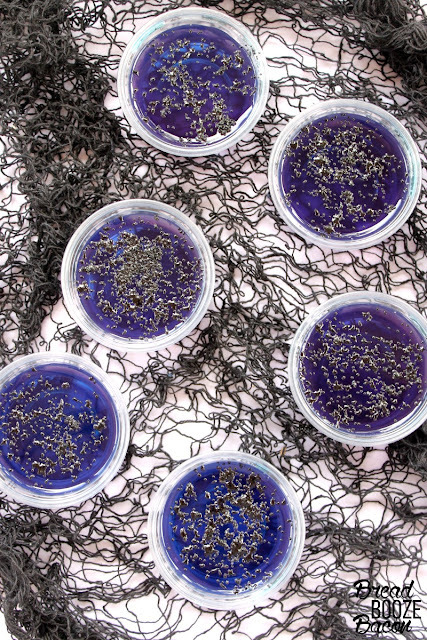 Place all 24 plastic cups on a baking sheet or on your serving plate, for easy transport. Leave the lids off the cups. Place the Jello mix powder in a medium mixing bowl. Add 1 cup boiling water to the powder and whisk to combine until the powder is dissolved. Add the cold water and vodka. Whisk to combine. Fill each plastic cup half way full with blue jello. Place the cups in the fridge and chill until the jello is just about set, about mins. Remove the plastic cups from the fridge and carefully pour the purple jello over the blue jello, to create layers, filling each cup the rest of the way. 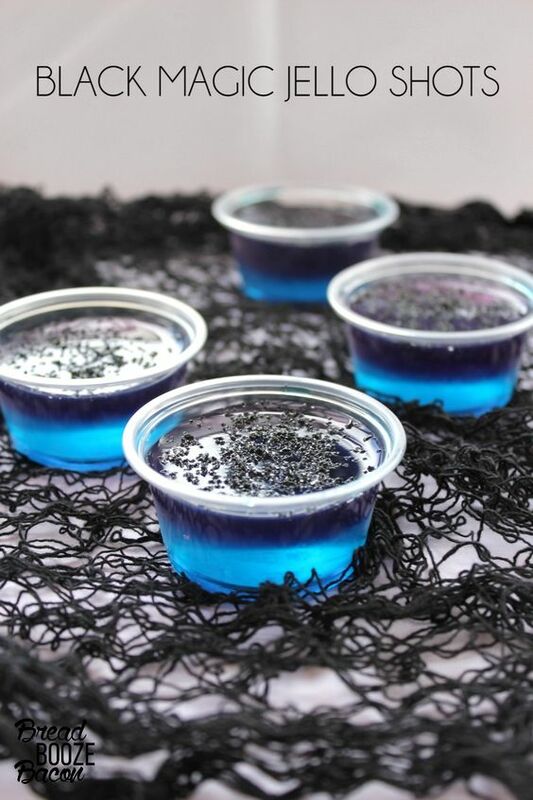 Remove the jello cups from the fridge, and sprinkle the top of each shot with black sugar. You don't want to completely mask the purple, but there should be a good layer of sugar. Place a lid on each cup and refrigerate the shots until ready to serve or put out at your party. I recommend making the jello for the purple layer right after you put the blue layer in the fridge. Then let the purple layer cool off while the blue layer sets up. That way the hotter jello won't melt the first layer when you add it in. 0 Response to "BLACK MAGIC JELLO SHOTS"